Labradors have a “wash and wear” coat, meaning they don’t require a lot of grooming. But, just because they don’t require a lot of it doesn’t mean you should be skipping out on it. Grooming your lab is a wonderful way to bond with him, and helps keep him healthy. You wouldn’t want to go a long time without brushing your own hair, so why not make sure your lab’s coat is the best it can be? Dog brushes are available in many shapes and sizes, but there are really only three main types. Bristle brushes are used on all coat types. They are varied according to the space between bristles, as well as the bristle length. Typically, the longer the hair on the dog’s coat, the more widely spaced the bristles need to be. Longer coats also need longer bristles. If your dog has a coarse coat, choose a stiff bristle brush. Labrador pet parents should use a bristle brush. Wire pin brushes may or may not use rubber tips on the ends. These brushes are the ideal choice for pets with medium to long hair. They are also a good option for those who have woolly or curly coats. There are some combination wire pin and bristle brushes available, but these are typically not required for labs because of their short hair. Slicker brushes use fine wire bristles. They are useful for getting rid of tangles and mats, and as such are recommended for breeds with long hair. It is a good idea to have one on hand for your Labrador retriever, but it is not a brush you will need to use often. 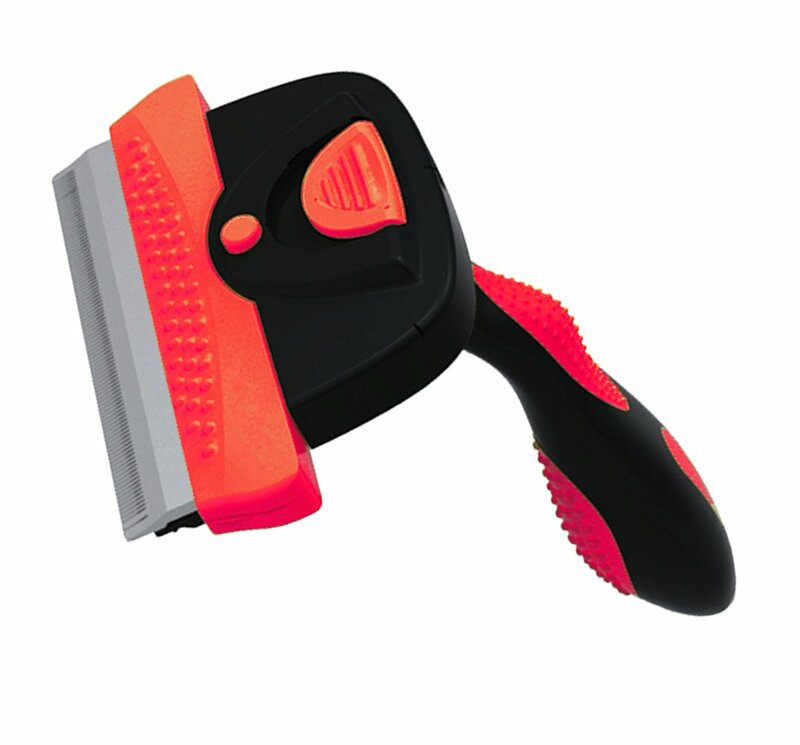 De-shedding tools are also available to really get down to your pet's undercoat. Newer tools feature a metal comb and/or blade with a handle. These are designed to remove dead hair from your pet before it has a chance to fall out and end up all over your furniture or your favorite sweater. Depending on your pet’s coat, and how likely it is to tangle, you may need more than one deshedding tool. If you have discovered you are using the wrong type of brush for your lab’s coat, it’s okay. As long as you and your dog are happy with the results, you don’t really have to worry about which tool is recommended for your breed and coat type. In the end, it is about what works best for you and your dog. Brushing your dog is only one part of the entire grooming process, but it helps keep the coat in great condition. Plus, it gives you a chance to find problems before they get serious, which helps keep your dog happy. Brushing the coat regularly stimulates the skin’s natural oils to keep the coat shiny. Your lab only needs a thorough brushing once a week, using either a natural or nylon bristle brush. However, daily brushing is not a bad idea. It feels great to your dog, and helps keep him incredibly clean. When brushing your labrador’s hair, use a soft to medium bristled brush with long to medium spaced bristles. You can also use a wire pin brush. Reserve the slicker brush for any mats and tangles in the fur. Using a bristle brush every day can greatly decrease the number of tangles and mats you have to deal with. As you brush, make sure you are brushing with the coat’s grain. If your lab isn’t particularly fond of grooming, it is important to teach him to associate grooming with things he loves. Start slow and easy. Things like brushing, bathing, nail trimming, and ear cleaning, should be intertwined with special treats, new toys, and walks in the park. When you shower him with praise, he will soon learn to love everything associated with grooming, even brushing. Before brushing your dog, inspect him with a head to toe massage. As you massage your dog, check for lumps, dry patches, any hair loss, or other abnormalities on the skin. The massage before brushing will help to loosen any dead hair and skin to make it easier to brush away. If you notice any tangles, warts, or other issues, use a slicker brush to get rid of the tangles, and avoid the warts or bumps when using the brush. Be careful with the amount of pressure you apply, as the skin can be fairly tender. Since you want to promote your dog enjoying the experience, being too rough and causing pain is not the way to go about it. Brushing your dog’s fur on a regular basis makes it easier to deal with bathing. Luckily for you, labs do not need bathing very often. Only bathe your dog when he is incredibly dirty. Bathing them too often can cause their skin to dry out. Letting your lab play outside every day helps keep the skin moist. 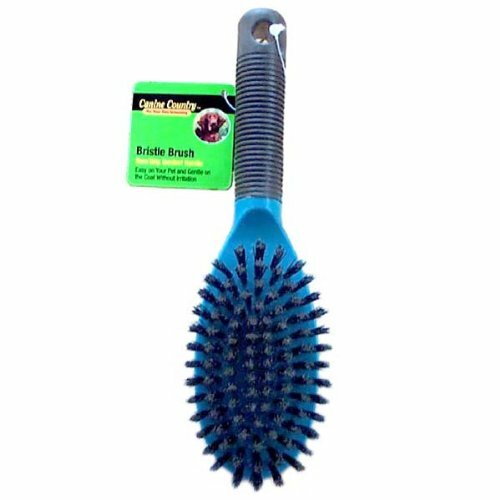 This dog brush uses a combination of rubber pins and nylon coated tips to provide the benefits of both a slicker and a nylon brush for short haired dogs. The tips help to massage the skin for better distribution of the natural oils to make the coat healthier and shinier. It also helps with the undercoat and the removal of loose hair. For pet parents looking to reduce shedding, this is an excellent tool. This is also a good choice for you if your labrador is prone to tangling, as the slicker brush aspect of this tool can help reduce tangles and matting. The Nylon Bristle Dog brush is an affordable, durable brush suitable for any short haired dog. 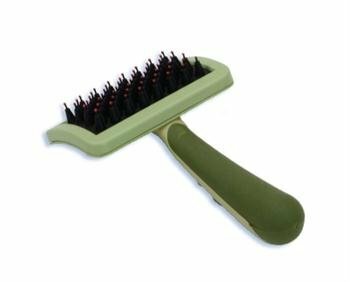 The brush is 8’’ long and features 1/2’’ nylon bristles that are gentle on your pet. There are many products on the market like this one, so there isn’t anything particularly special about this one compared to others. This product is built to look similar to your own hairbrush, and the hole in the handle can help you hang it up so that the dog does not chew on it when you’re not using it. If you notice fur shedding is a major issue - try using this in conjunction with another deshedding tool that really gets down into the undercoat so you can catch the hair before it falls out. This tool is available for both long haired and short haired dogs, so labrador owners need to make sure they’ve chosen the short haired option. The difference between the two is the spacing between the metal tines of the comb, which can make a difference in the overall grooming. It’s also available in multiple sizes, ranging from extra small to giant. These sizes only refer to the size of the comb itself, so you can use them with any size dog. However, it is best to use the larger comb with larger dogs because the larger combing area means you won’t need as many strokes to get through the brushing. This tool can reduce shedding by up to 90%. The fur ejector button will remove loose hair from the tool easily. If dog hair is taking over your home - and you swear you have enough fur to build another dog, you’re not alone. t’s backed by an “unbreakable” guarantee, so you have a lifetime warranty - and if you decide you don’t like it, or it breaks, you can get your money back, no questions asked. Plus, if you have a cat in the home, you can use it with them, too. This tool is available in two sizes: small and extra large. The small brush is the ideal choice for medium hair dogs that weigh anywhere from 10 to 20 pounds, and also works well on cats. 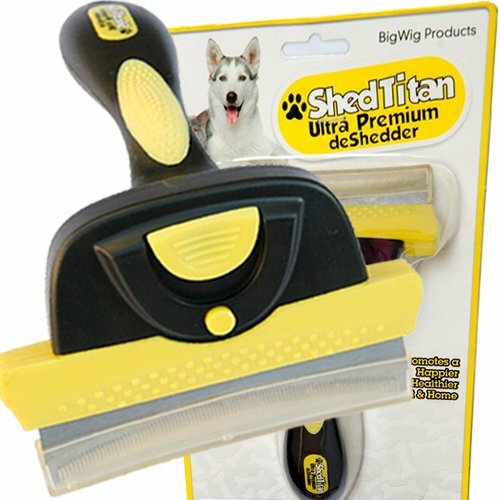 The extra large brush is an ideal choice for dogs that weigh 50 to 120 lbs. If your dog is somewhere between 20 and 50 pounds, it appears this brush may also be available in a medium size, too. The extra large brush is the ideal choice for a labrador. Using this brush can help reduce shedding by up to 90%. 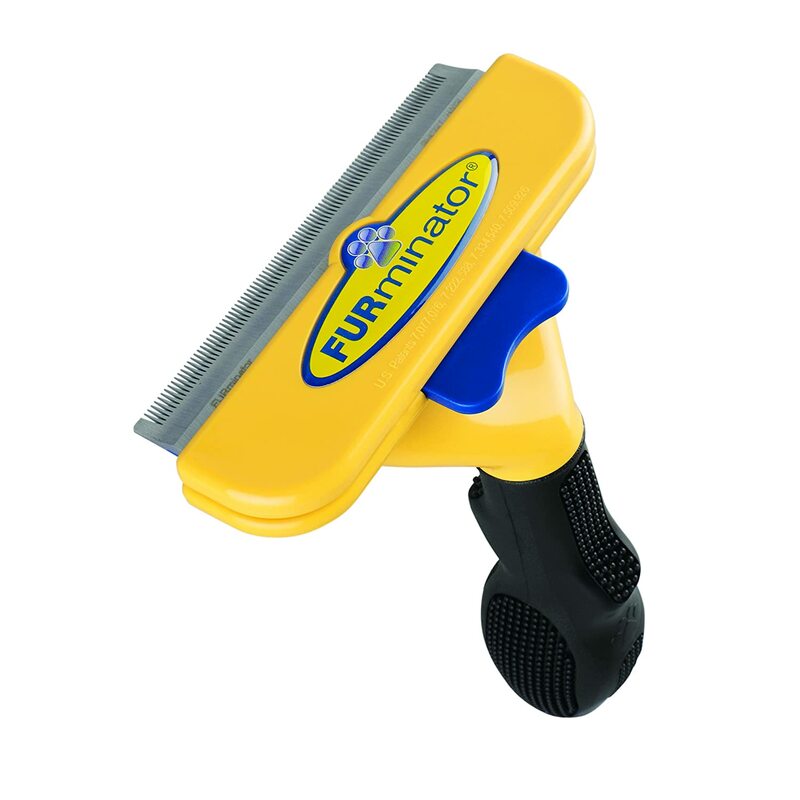 The brush features rounded edges so it contours to the dog’s body to remove more hair with fewer strokes. There’s even a fur ejector button to allow you to easily remove hair from the tool. There’s a blade release button and cover for safety, too.